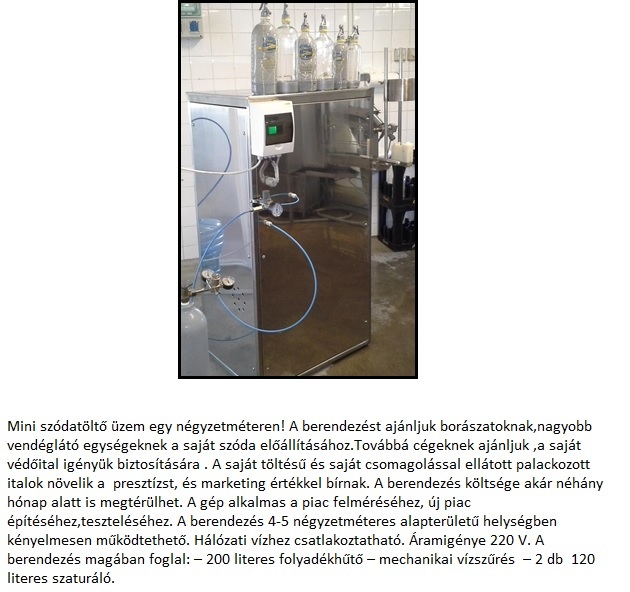 The equipment is recommended for wineries, larger catering units for the production of their own soda. We also recommend it for companies to provide their own protective drink. Bottled drinks with self-charged and self-packaged packaging adds prestige and value for marketing. The cost of the equipment can be recovered within a few months. The machine is suitable for surveying the market, for constructing and testing a new market. The unit can be operated comfortably in a room of 4-5 square meters. Connects to main water supply. Power consumption is 220 V. The equipment includes: – 200 liter liquid cooler – mechanical water filtration – 2 pieces of 120 liter saturators.